Winners of the Offies 2019 Awards, held in the refurbished Grand Hall at Battersea Arts Centre were announced in what was the ninth year of the awards presented by Off West End. In 2018, Offies assessors were invited to 400 shows across 80 venues across London, resulting in 430 nominations in 28 Offies categories. Among the musicals, The Rink at Southwark Playhouse was a big winner in four categories (Choreography: Fabian Aloise, Musical Director: Joe Bunker, Musical Production) including a double victory for actresses Gemma Sutton and Caroline O’Connor for Best Female Performance in a Musical category. Elsewhere, there were acting plaudits for Gary Trainor for Rothschild & Sons at the Park Theatre; Mairi Barclay in Pippin at the Southwark Playhouse; and Rob Houchen in Eugenius! at the Other Palace. 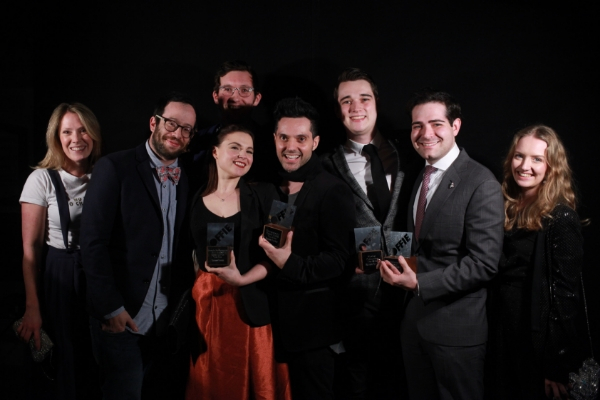 Grindr the Opera at the Above the Stag was named Best New Musical and Gabriella Slade was honoured for her costume design for Six at the Arts Theatre. The Bush Theatre’s production of Arinzé Kene’s Misty (which transferred to the West End) was recognised as Best Performance Piece. Special awards acknowledged the work of the Bush Theatre’s artistic director Madani Younis, David Jupp for reopening Battersea Arts Centre’s Grand Hall and producer Sally Wood (Wasted​ at Southwark Playhouse).